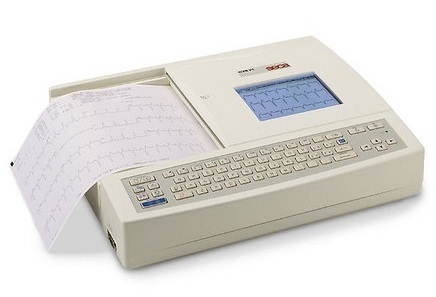 Seca ECG machines, ECG Sundries, SECA CT3000i, SECA CT6i, SECA CT8000P, SECA CT110, SECA CT8000i, ECG paper, ECG electrodes, OMRON Heartscan. SECA ECG Electrodes and Trolley also available. Please enquire about a free demonstration. 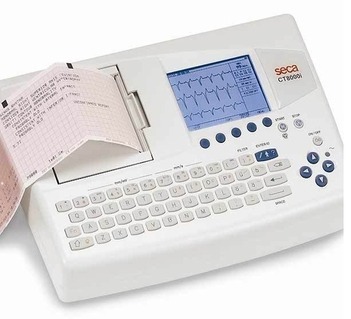 seca CT110 CardioConcept supplied complete with USB connecting cable, full length traditional patient cable and CardioConcept software on USB flash drive (requires Windows 2000 or above). Alligator clips and 500 disposable electrodes. The device can record about 30 seconds of heart rhythm and waveform each time it is activated. After recording, the automatic evaluation software will check the collected data. Directly after completing the measurement the recorded rhythm strip can be reviewed on the LCD screen. For further detailed evaluation the data can be transfered to a PC screen with the ECG-viewer software. The SD memory card can store up to 300 recordings offering sufficient space for long-term monitoring. The HeartScan is very simple to operate.